◕‿◕ CONVENIENCE - auto sensor light bulbs don\'t need using hand to turn on/off for saving time and use easy. Wide application perfect for gardens, yard, patio, hallways, office, front door, driveway, garage, school, hospital, party and so on. ◕‿◕ SECURITY - smart light bulbs can recognize day and night, Automatically turn on for you in the night. Provide more security. pole lamp and other security lighting. ◕‿◕ QUALITY - dusk to dawn led light bulb is made of High quality LED, working life for 30000 hours.Normative E26 base socket of America. The smart light bulbs have been certified with CE, ROSH and FCC. 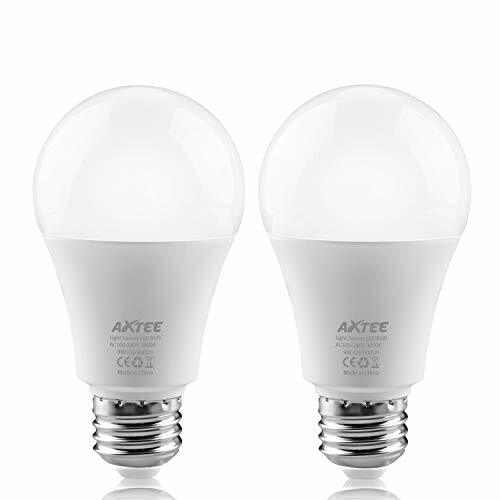 ◕‿◕ ENERGY SAVING - light Bulbs lamp LED 9W(90 watt Equivalent), Automatically turn off on day and energy saving and times. ◕‿◕ WHAT YOU GET - we are 100% warranty 90-day money back policy and full refund unconditionally, 24 hours online customer service about dusk to dawn light bulbs.